SCANDAL TOUR 2018 "Kanshasai," SCANDAL's Zepp Tour, kicked off yesterday, 11/2, in Aichi at Zepp Nagoya. This tour is being held in commemoration of the tenth anniversary of their major label debut. 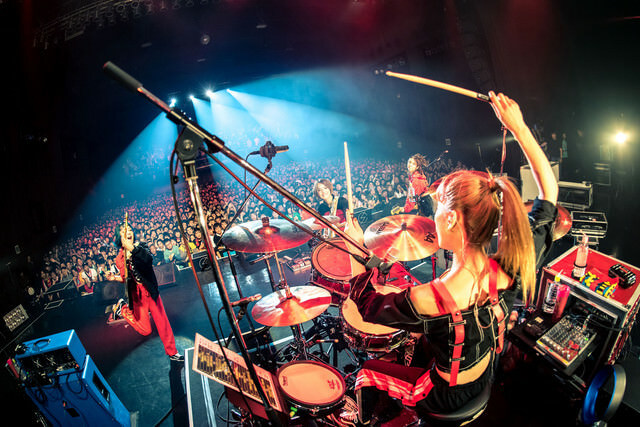 Hitting the stage in red and black outfits, SCANDAL deployed a live performance with a set list that mixed together their new and old songs. During the show, HARUNA expressed their gratitude and determination for having celebrated this tenth anniversary: 「We're grateful of these ten years that have passed. They truly were long and also, since we worked so hard, short. They've been ten dense, precious years for myself and the other members. We progressed up until this point with a great momentum, and we know that, just like life, there are beginnings as well as endings. That's exactly why we want to keep living as hard as we can now, and do as much as we can」. During the encore they announced their fan club tour that begins in March of next year. On this tour SCANDAL will be touring around three cities in Aichi, Osaka, and Tokyo. On this tour SCANDAL will be touring around three cities in Aichi, Osaka, and Tokyo. How about the show in Sapporo? peachclub wrote: How about the show in Sapporo? It looks like you misinterpreted that sentence, as it's actually talking about the upcoming MANIA tour. Only 3 dates and cities in total: Nagoya, Osaka, Tokyo. Oh I see. That was really stupid. Thanks for the clarification.